Hanhaaan! Have at you, imbecile! 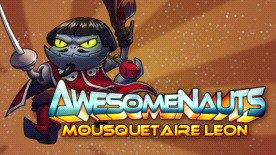 It's moi, Leon, le mousquetaire extraordinaire! Now with an extra sharp rapier, more vin, more fromage and more amour, Mousquetaire Leon! This DLC contains a custom skin for Leon in Awesomenauts!